1. Steel Studs — 1-3/8 in. deep by 1-5/8 in. wide with 1/4 in. folded flange in legs, fabricated from 26 MSG electrogalvanized steel, 3/4 by 2 in. rectangular cutouts punched in ends. Studs cut 1/2 in. or less in length than assembly height and attached to inner layer wallboard with No. 6 by 1 in. long self-tapping sheet metal screws spaced vertically 24 in. OC. 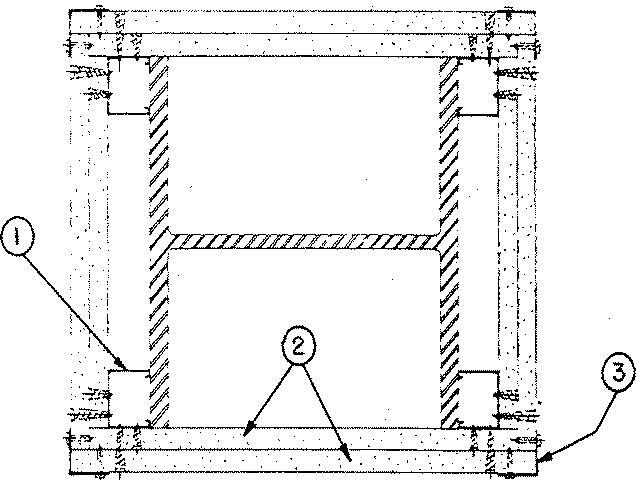 Alternate Construction, Steel Framing Members* — Clips attached to column flange 4 ft OC and 1-1/4 in. from the top and bottom of column. 1-1/4 in. by 1-1/4 in. 28 MSG angle laid in place over clip. Angle cut 1 in. less in length than assembly height. JOHN WAGNER ASSOCIATES INC, DBA GRABBER — Types CB, CB1Clips. 2. Gypsum Board* — Two layers of 5/8 in. thick wallboard. Outer layer attached to steel studs with No. 6 by 1-5/8 in. long self-tapping sheet metal screws spaced vertically 12 in. OC. As an option, nominal 3/32 in. thick gypsum veneer plaster may be applied to the entire surface of Classified veneer baseboard. CERTAINTEED GYPSUM INC — Types FRPC, SF3, EGRG, GlasRoc, GlasRoc-2, Type X, Type X-1, Type C, 5/8" Easi-Lite Type X.
GEORGIA-PACIFIC GYPSUM L L C — Types 5, 6, 9, C, DA, GPFS1, GPFS6, DAP, DAPC, DGG, DS, LS, TG-C, GreenGlass Type X, Type X, Veneer Plaster Base - Type X, Water Rated - Type X, Sheathing - Type X, Soffit - Type X, Type LWX, Veneer Plaster Base-Type LWX, Water Rated-Type LWX, Sheathing Type-LWX, Soffit-Type LWX, Type DGLW, Water Rated-Type DGLW, Sheathing Type- DGLW, Soffit-Type DGLW, Type LW2X, Veneer Plaster Base - Type LW2X, Water Rated - Type LW2X, Sheathing - Type LW2X, Soffit - Type LW2X, Type DGL2W, Water Rated - Type DGL2W, Sheathing - Type DGL2W. NATIONAL GYPSUM CO — Types -eXP-C, FSK, FSK-C, FSK-G, FSW, FSW-C, FSW-G, FSW-3, FSW-6, FSW-8, FSL, and FSMR-C.
PABCO BUILDING PRODUCTS L L C, DBA PABCO GYPSUM — Types C, PG-3, PG-9, PG-11, PG-C, PGS-WRS. THAI GYPSUM PRODUCTS PCL — Type X, Type C.
UNITED STATES GYPSUM CO — Type USGX. 2A. Gypsum Board* — (As an alternate to Item 2) — Composite Gypsum Panel — Nominal 5/8 in. thick panels. One of the two layers of Gypsum Board (Item 2) may be substituted with one layer of and secured as described in Item 2. 2B. Wall and Partition Facings and Accessories* — (As an alternate to Items 2 and 2A) — Composite Gypsum Panel — Nominal 5/8 in. thick panels. One of the two layers of Gypsum Board (Item 2) may be substituted with one layer of composite gypsum panel and secured as described in Item 2. 3. Corner Beads — No. 25 MSG galv steel, 1-1/4 in. legs. Attached to wallboard with No. 6d by 1-3/4 in. nails spaced 12 in. OC at each leg. 4. Steel Column — Min size of column, a W10X49, with outside dimensions of 10 x 10 in. with a flange thickness of 9/16 in., a web thickness of 5/16 in., and a cross-sectional area of 14.4 sq in.